Installing a programmable thermostat is a small job that can have a big impact on your monthly heating and cooling bills. According to the Department of Energy, installing a programmable thermostat can help you save between 5% and 15% on your monthly heating and cooling bills. The work takes less than an hour, and with many models available for less than $25, you can recoup the initial expenditure after only one season of use. Bear in mind that while you can cut costs with a manual thermostat, the attention required to do so makes savings difficult to achieve. Reason being that thermostat adjustments must be made throughout the day, every day. Miss an opportunity to conserve, and you’re effectively throwing money out the window. 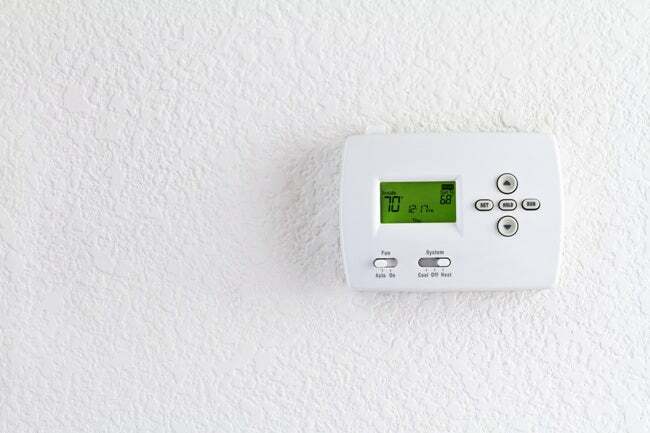 A programmable thermostat relieves homeowners of that responsibility, enabling them to configure a heating and cooling cycle that corresponds to their daily schedules. Once the program has been set, it can be forgotten about. But you can always update it with changes if, say, you’re headed out of town. Imagine the air conditioning automatically turning on ten minutes before you get home. And wouldn’t it be nice not having to remember to turn the heat down as you leave for work? Taken together, these small advantages make the programmable thermostat not only a budget-friendly upgrade, but also a convenience. To install a programmable thermostat, you don’t need to be an expert handyman. Even a novice can easily complete the project using the instructions below. Turn the breaker off to your furnace and air conditioning system. Take the cover off your old thermostat. (Most pop off with slight pressure, but some covers must be unscrewed.) Next, remove the screw holding your old thermostat to the wall. Carefully pull out your old thermostat, but leave its wires connected for now. Take a moment to label the wires that are part of the existing installation. Attach a small piece of masking tape to each wire, and on that tape, write the letter that is indicated where that particular wire attaches to the old thermostat. Usually, the letter corresponds to the color of the wire, but not always. 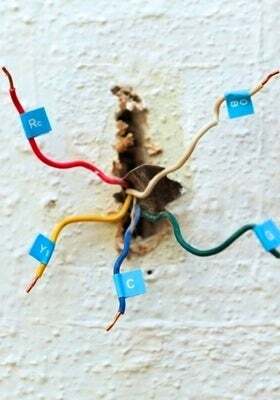 Tape the existing wires to the wall, or wrap them around a pencil or small screwdriver, so they don’t retract into the wall cavity the instant that you disconnect them from the old thermostat. Experience has shown that being extra careful at this point can spare you from a great deal of unnecessary aggravation. If only two wires connect to your existing thermostat, then it’s not directly wired to a power source. That only means the programmable unit you purchase must be able to run on batteries. More than two wires? Chances are that it’s direct-wired; you’re free to shop from a wider range of replacement models. Fix the mounting plate of your new programmable thermostat to the wall. (It may be necessary to drill pilot holes and use plastic anchors.) Next, match letter to letter as you connect the wires to the replacement unit. Install batteries if appropriate, finally snap on the thermostat cover to finish the job. Now, get ready to watch your energy bills fall like mercury on a crisp winter’s day!